There has been a significant change in thinking about the problems posed by dementia (chronic progressive neurodegeneration causing decline in cognitive function) by both researchers and the wider health promotion community over the last few years. In the early 1990s although knowledge of dementia risk factors was emerging, it was concluded that there was no justification to conduct trials or introduce large-scale interventions to prevent the illness.1 Over the following 20 years, the focus was primarily on developing treatments for the pathological brain functions identified as the cause of cognitive decline. In part this was because the risk factors identified, old age, genetics and head injury, were not felt to be amenable to change, but it was also because the drive to develop pharmacological treatments, based on the cholinergic and amyloid hypotheses, was very strong. The failure of these paradigms to deliver meaningful treatments and the recognition that the incidence of dementia has been declining in certain communities led to rethinking the approach, with a move away from treatment towards prevention.2 The discovery that biomarkers of disease show changes many years prior to the development of clinically significant symptoms suggested that interventions must be made much earlier if the disease is to be treated or, more importantly, prevented. The scale of the problems associated with an aging population, the development of dementia and provision of care are well known; currently 850,000 people in the UK and 47.5 million worldwide live with dementia. These figures could rise to 2 million and 150 million respectively by 2050.3 The numbers translate not only into significant direct and indirect care costs (higher than the costs of cancer, heart disease or stroke) but also very considerable individual suffering. In the absence of effective treatments even relatively small reductions in the incidence of the disorder or delaying the onset of clinical symptoms would reap significant benefits. Taking a lifestage approach means considering interventions when it is unlikely that many people would be thinking about developing dementia. Providing education beyond primary school level is probably the most powerful intervention globally. Fewer years of education is associated with a Relative Risk (RR) of developing dementia of 1.59 (95% CI 1.26–2.01). Because worldwide the estimated prevalence of poor education is so high (40%) this leads to a high Population Attributable Fraction (PAF) for dementia.8 However, this discussion will concentrate on mid-life interventions that have the potential to be promoted through insurance channels. 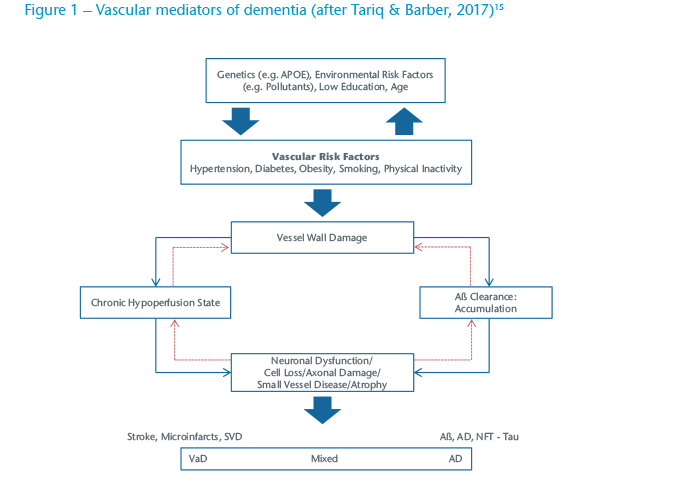 The widespread introduction of programmes to reduce heart attack and stroke by ensuing good cardiovascular health in mid-life (age 40-64) are probably responsible for the reductions seen in the incidence of dementia (“What’s good for the heart is good for brain”) in some markets.10 Changes in vascular risk have been implicated not only in Vascular Dementia (VaD) but also Alzheimer’s Disease (AD). In clinical practice many patients who undergo scanning have evidence of changes consistent with both of these common forms and are classified as having Mixed Dementia (see Figure 1). The second group identified for potential interventions are intimately involved with “lifestyle” where there may be more scope for intervention (see Table 2). Some early work argued that smoking might actually be protective against the development of AD but the situation has subsequently become much clearer. Current smoking increases the risk of all causes of dementia whilst smoking in the past does not increase the risk. With 20% of the UK population continuing to smoke, the PAF is high meaning significant reductions in dementia could be achieved. 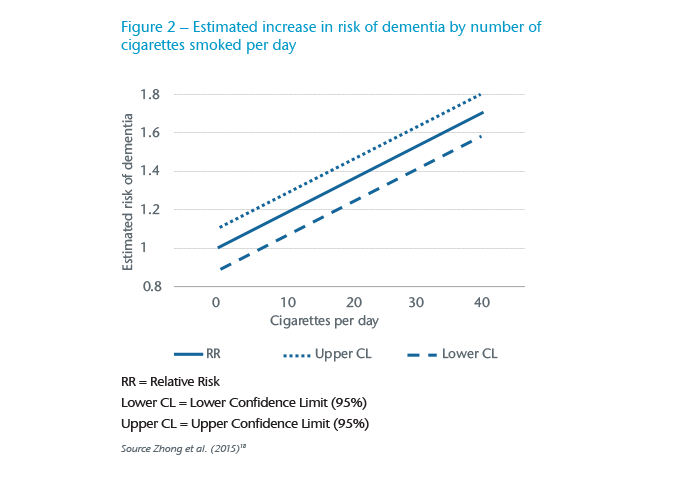 What is not yet clear is when and for how long people need to be cigarette-free to reduce their dementia risk in old age (see Figure 2). This approach does not do justice to the harms identified by Schwarzinger et al. (2018) who reported that 57% of those developing early-onset dementia also had alcohol use disorders.23 It is likely this group had co-morbidities that might also predispose them to developing dementia.24 Arguing that your next glass of wine is going to help prevent dementia will not be very persuasive. The effects of diet in mid-life on the development of dementia are much debated. Read et al. (2017) concluded that the evidence is sparse because the majority of studies concentrate on immediate health benefits rather than long-term outcomes.25 However the “promoting brain health” team concluded that regular vegetable consumption and a Mediterranean diet may protect against dementia, particularly AD. The evidence for the benefits of vegetables is more convincing than it is for fruit.26 A better diet probably works by developing cardiovascular health and a healthy weight. The size of the impact of changing diet is not clear although it clearly has a relationship with obesity and diabetes. There is an association between mid-life mental activities and lower risk of dementia in later life much of which is explained by early education and developing a cognitive reserve. Even for those with less education working with more complex data has the potential to reduce the risk. Although the studies are inconsistent in their methodology and outcomes there is enough evidence to give some support to the “use it or lose it” rubric. Issues such as quality of sleep and air experienced in mid-life may have an impact on developing dementia in late-life but like many of the other potentially modifiable risk factors evidence is not good but the arguments for generally improving health through interventions is strong for both short and long term benefits. Dementia, in all its myriad forms, has no treatment that is effective once clinical evidence of the syndrome has emerged. This does not mean that significant steps cannot be taken to improve the quality of life of those living with the illness and their carers. Medical interventions at the pre-clinical phase may be on the horizon but interventions made in early and mid-life can happen today and significantly reduced the risk of developing dementia. The insurance industry has engaged heavily in changing its relationship with their customers in recent years, developing relationships through rewarding healthy behaviours and providing well-being interventions well beyond their traditional remit. 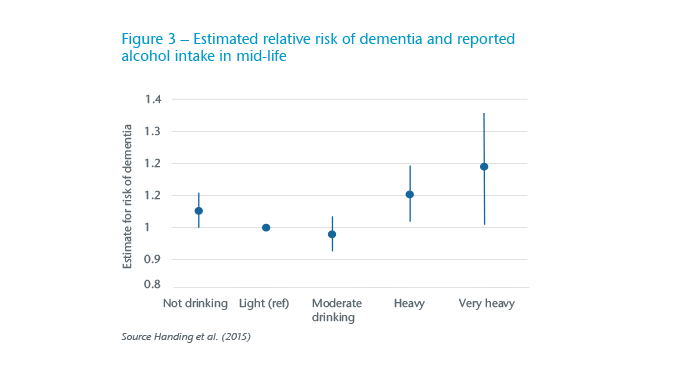 To date the importance of interventions to preventing dementia have not been stressed, partly perhaps because the people who might benefit from these interventions are not necessarily considering the consequences of their behaviours into very old age. However, as more people become concerned about this issue, and products develop to reflect the risks of longevity (long-term care riders to whole of life policies for example), the opportunity for insurers to play a role in dementia prevention becomes a reality. 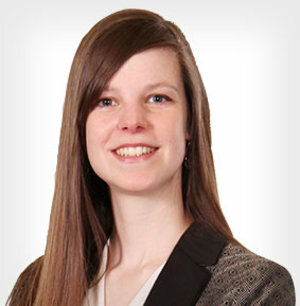 Although many companies are providing well-being services to their workers, the fluidity of the employment market allows insurance firms to provide continuity in this area. In order to prevent dementia it is likely that a multipronged approach will be required and no single intervention will be adequate. 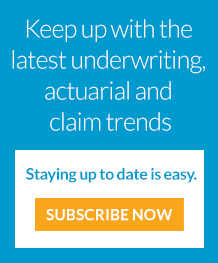 The engagement of insurers with their clients as they develop their families and careers offers a unique opportunity to intervene positively to reduce the suffering from dementia in years to come.